Since David Bowie’s death on January 10 there has been feverish speculation about the authorship of The Villa of Ormen, a creepy Tumblr created in November and December that takes its name from the opening line of Bowie’s song “Blackstar.” Was this macabre collection of images another facet of the pop icon’s carefully stage-managed exit? It seems not. On January 24, the blog’s unknown creator posted to say that any likeness to the imagery in Bowie’s two final videos was a coincidence. 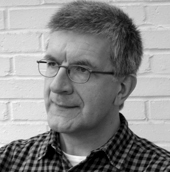 For a while there, The Villa of Ormen felt genuinely uncanny. 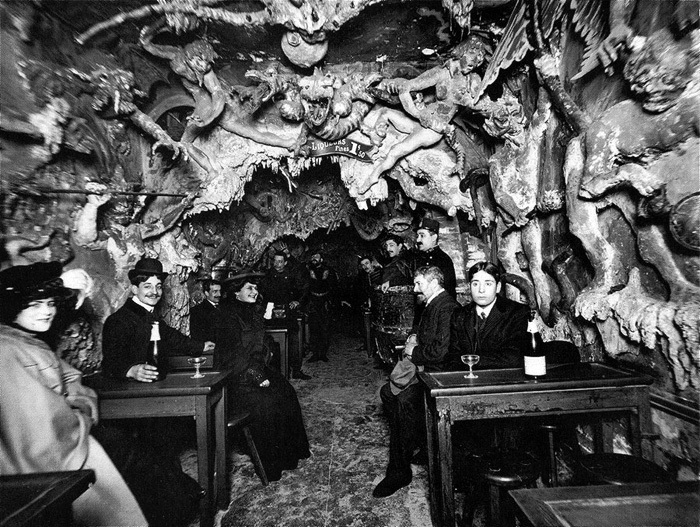 I was particularly taken by an antique image of a ghoulish cavern, apparently some kind of café, hosting a disquieting cabal of drinkers, both smiling and vacant. The oppressively low ceiling is bedecked with writhing bodies—presumably the damned—and ghastly demons. Other viewers clearly felt the same way about the picture. Last time I looked, it had 12,545 notes, making it the second most popular provocation in the anonymous set of images. 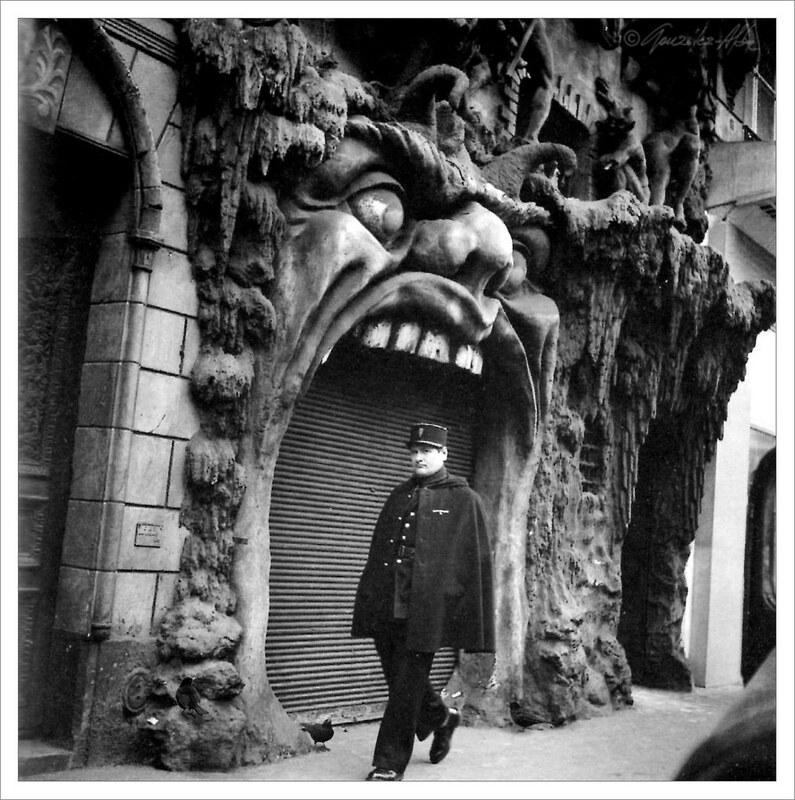 I knew of this place, the Cabaret de l’Enfer (Hell) in Paris, but only from the outside in photographs of its satanic mouth-entrance by Eugène Atget and Robert Doisneau, whose droll scene shows a gendarme framed by its bite. Oddly, another policeman can be seen toward the rear in the shot of the interior by Harry C. Ellis (1857-1928)—an American photographer who worked in Paris—taken at some point between the cabaret’s opening in 1898 and closure in 1925. The hellish façade at 53 Boulevard de Clichy in Montmartre survived until the 1950s, and the site is occupied today by a Monoprix supermarket. L’Enfer was next door to an equally bizarre establishment called Le Ciel (Heaven) and the lost venues have become the stuff of Internet legend. 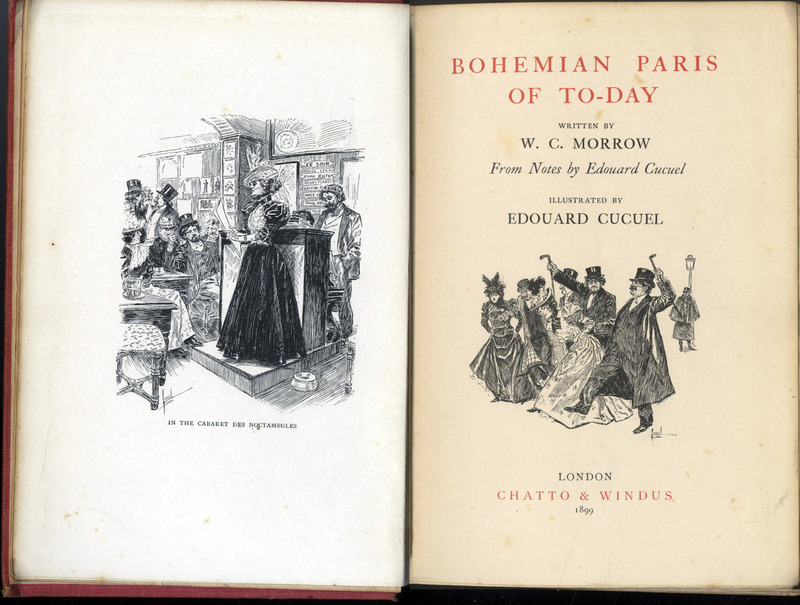 In Bohemian Paris of To-day (1899), William Chambers Morrow published an eyewitness account of the frolics at L’Enfer, which would seek to thrill visitors with a diabolical floor show: “‘Enter and be damned—the Evil One awaits you!’ growled a chorus of rough voices . . . Near us was suspended a caldron over a fire, and hopping within it were half a dozen devil musicians, male and female, playing a selection from ‘Faust’ on stringed instruments, while red imps stood by, prodding with red-hot irons those who lagged in their performance.” Soon after this, Satan makes an entrance with a flaming sword and terrorizes the customers. Ellis, who took pictures of everyday occupations and street scenes, has evidently dropped by at a quieter moment. The sinister subterranean revellers with occult intentions might just be ordinary folk enjoying an amusing night out.